The National Maternity Hospital project. 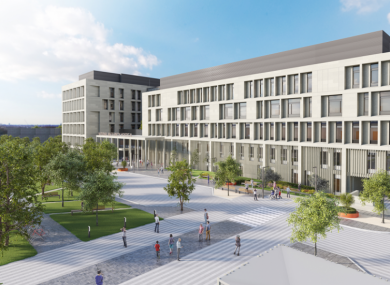 ENVIRONMENTALIST DUNCAN STEWART has urged the government to revise the plans for the National Maternity Hospital saying the project’s approval is being rushed through because it does not meet new standards to reduce carbon emissions. Stewart made the comments at a press conference alongside climate activists at Buswell’s Hotel in Dublin today. The group say the building’s design falls fouls of the EU’s Energy Performance of Buildings Directive which is due to come into effect on 1 January, 2019. The RTÉ personality said it’s been known since 2010 that all public buildings will have to comply with the new directive and it’s “shameful” that the plans are not compliant with the required standards. He added that energy performance figures in the project’s current application are “massively out of line” with the standards laid down in the directive. “From my perspective, when I look at this, I think of those young babies that will be born in this hospital over the coming decades. Those babies born today will live into the 22nd century, hopefully well into the 22nd century. But, really, are we being fair to them with the way we are treating climate change?” he asked. Climate change is the greatest existential challenge that human civilisation has ever had to face and Ireland is not performing. We’re completely out of line with the requirements of the EU. We’re failing dramatically to meet our 2020 targets, instead of achieving a 20% reduction it looks like we’re only going to achieve a 1% reduction. The architect said that we’re heading into 3.5-5 degree rise in global mean surface temperature within this century. “Those babies are going to suffer in their childhood, into their young adulthood, into their later life with this increasing level of greenhouse gas emissions into the atmosphere,” he continued. Stewart argued that changing the hospital’s plans now would be a “simple matter” and would not cause significant delays whereas waiting until it has be be retrofitted in the future will cost millions. Speaking at the press conference activist Donna Cooney said she is considering legal action to halt the construction of the building. Jeff Colley, the editor of Passive House magazine, said the state “pulling a fast one” by not complying with the incoming regulations sends a bad message to the construction industry. Email “'Those babies will suffer': Duncan Stewart calls for revision of National Maternity Hospital plans”. Feedback on “'Those babies will suffer': Duncan Stewart calls for revision of National Maternity Hospital plans”.